This incredibly versatile product supports up to two 24" monitors each with a maximum individual weight of 26.5 lbs. not only will this strong and sturdy mount have no trouble holding vesa certified 75x75 or 100x100 monitors, (fitting the above criteria), it is also extremely adjustable! benefits of stand mounting:this type of mount is the classic desk stand. 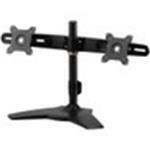 maneuverable and reliable, stand mounts are the most popular mounting choice for monitors.